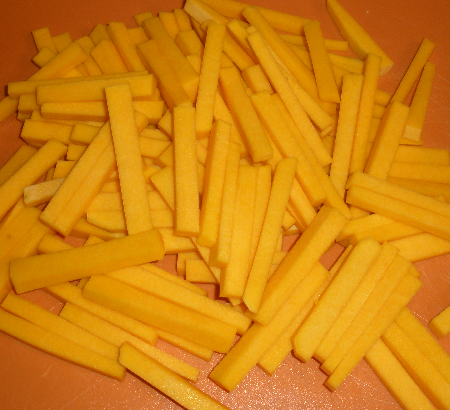 Batonnet is a French culinary term that refers to a specific type of cut used in preparing vegetables such as potatoes for use in other dishes or as an appealing appetizer. 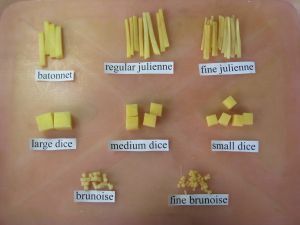 Similar to the allumette and julienne, the batonnet is typically the largest of the three cuts and is typically used to set up a vegetable for dicing. This type of cut is typically 1/4 inch (6.35mm) by 1/4 inch (6.35mm) and about 2 inches (about 5 cm) long. Learning how to properly cut a batonnet is one of the most important parts of early culinary training, since fast and precise cutting is often crucial for restaurant food preparation. The batonnet is typically made by first preparing an item, such as a potato, by cutting off each end and cutting the potato to have four flat sides to work with, like a rectangle. Once the item to be cut is properly squared off, it should be cut into slabs that are 1/4 inch (6.35 mm) in width. These slabs are then stacked upon each other, typically only about three or four high to prevent excess sliding, and then cut again 1/4 inch (6.35 mm) wide. This creates a final cut that consists of a long stick that is 1/4 inch (6.35 mm) on each side, and can then be cut to about two to three inches (between 5 cm and 7.62 cm) in length for a true batonnet.